Last time I stayed at a hotel, I thought to myself, "Why is this hotel situated on a street and not in a tree?" OK, I didn't, but after seeing pictures of Hotell Hackspett in Västerås, Sweden, I did. 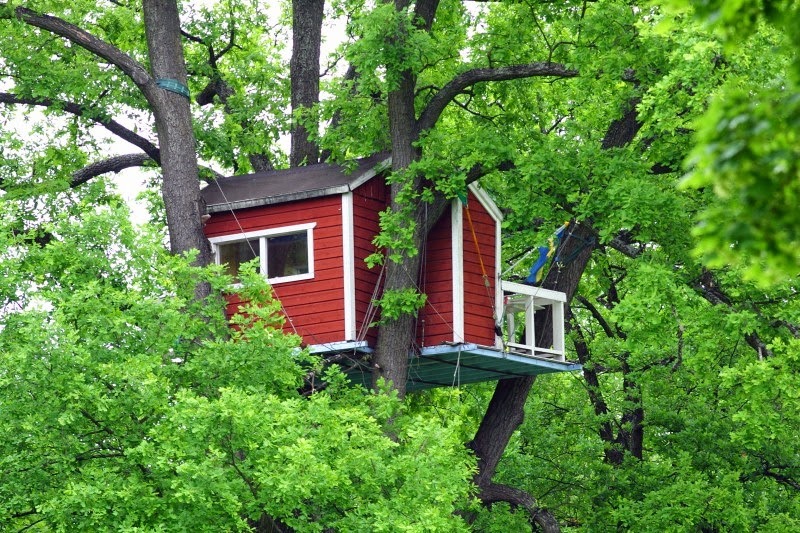 Because what's not to love about a tree house hotel perched 40 feet off the ground? You come and go using harnesses, the view can't be beat, and you're completely safe if the zombie apocalypse occurs while you're on vacation. Time to book a ticket to Sweden, amirite? Just don't expect an in-room Jacuzzi, or even running water. You get bottled water, a bed, a hot plate, a fridge, a dry toilet ... and a TREE HOUSE. If you're anything like me, a girl from Queens who grew up with a love of tree houses but a tragic dearth of trees, you'll agree that this hotel is a dream come true.